I think Mother Nature must be drunk. The weather she’s sending us would seem to prove it. A little more than a week ago, tornadoes were populating Kansas. Last weekend, we had frost advisories and high temps in the 60s. Today the temperature was 90 here in Topeka, and it’s projected to be higher tomorrow. At least she is keeping the humidity in check for now. And by this weekend we will be seeing frost advisories again. This unusual weather has me thinking of summer meals. Last Saturday I went to the Topeka Farmers Market (the only thing that will get me up early on the weekend) and my haul included bacon and tomatoes. So I thought BLTs would be a good idea and started surfing the Web to get ideas for a sandwich spread recipe to use instead of just plain mayo. That’s when I came across a recipe title for an Egg Salad BLT. Brilliant! Two of my favorite summer sandwiches combined. Plus, weren’t eggs and bacon meant to be together? 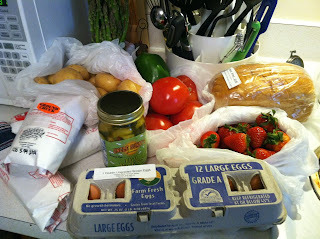 And, as you can see from the picture, eggs were also a part of my market purchases. Then I fried-up the bacon until it was brown and crunchy, sliced up the juicy red tomatoes, and broke off some leaves of crispy romaine lettuce. Then it was just a matter of piling it all between two slices of toasted wheat bread. The Picky Eater, being the selective eater that he is, didn’t go for the sandwich at first. He made himself an egg salad one with tomato and lettuce, and then ate the bacon on the side. However, after he saw my sandwich, he said, “That looks pretty good!” Unfortunately for him, he was too full at this point to try one. I bet he does next time. Because it was pretty good! Really good! An egg salad BLT, with a side of potato chips and a glass of cold iced tea—ah, summer has arrived. Even if it is just for a day or two. To make the egg salad, diced to hard boiled eggs to desired size. [I like mine chunky.] Add the rest of the ingredients and stir to combine. Spread a layer of egg salad onto a piece of bread. Layer the remaining ingredients on top. Enjoy! Love Blt’s….I bet this is wonderful with the egg salad!